But he didn’t talk to American-born and American-educated Ulana Suprun, Ukraine’s health minister, who might have opened his eyes wide. She is on the warpath against a horrific corruption machine involving billion-dollar scams performed by powerful doctors and a pharmaceutical mafia. It’s the kind of corruption that corrodes the foundations of democracy, and can destroy it in a country like this, that has known so little good governance for so very long. Suprun’s reform campaign has been one of Ukraine’s biggest hopes for success. If on his next visit Tillerson wants to take the time, Dr. Suprun says she would be happy to show him around the dark labyrinths of corruption that are here. It started about a year ago soon after Suprun first became the acting minister of health care. She walked into the crowded hallway of the oncology department at Kiev’s Okhmadyt hospital. Children with cancer, some crying in pain, some terrified, were waiting on a long bench together with their mothers for the doctors’ attention. The walls were covered in mold, which also threatened the fragile health of the severely sick patients. The fungus was so bad that paint and tiles fell off the walls. “I would show Tillerson the Okhmadyt hospital,” Suprun told The Daily Beast. “The state has spent about 300 million UAH [$11.5 million] to build the new facilities for that hospital; 60 million UAH [$2.3 million] was spent on equipment—which disappeared,” Suprun explained. Suprun, 54, is a tall woman with long blond hair. When we talked she was wearing black jeans and a black T-shirt emblazoned with a trident, a Ukrainian national symbol. People often recognize her on the streets and speak to her, but the former New Yorker walks around Kiev without any security. Suprun said that to her the mold on the walls at Okhmadyt symbolized the corruption that affected the entire health care system. “Some windows had cracks, some had no insulation; there was no air conditioning, mold was everywhere,” Suprun said. Three years ago she made a decision to move from Manhattan to Kiev together with her husband Marco. Both are ethnic Ukrainians raised to love and respect Ukraine’s culture, history, and language. Their original plan was to translate literature and develop a film industry, but Kiev’s pro-European revolution changed all their original plans. The two worked as volunteers, providing first aid to the wounded on Maidan square during the massacre of revolutionaries in February 2014. 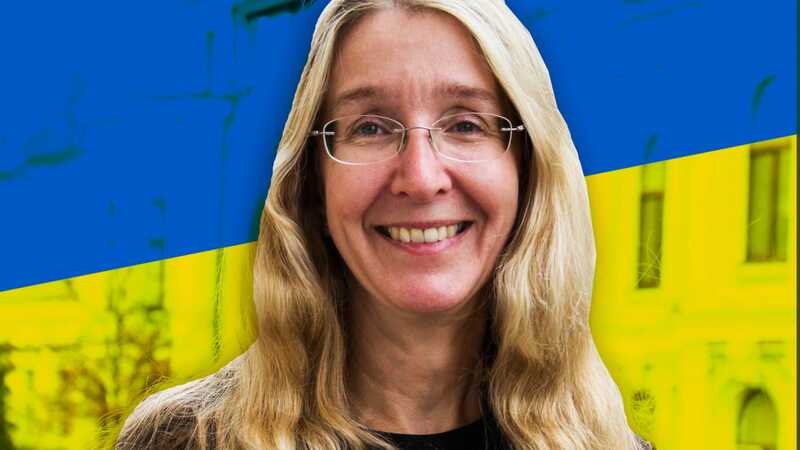 After Ukraine’s President Victor Yanukovych fled to Russia and the conflict began in Eastern Ukraine, Suprun went straight to the front lines to provide medical training for volunteer soldiers who did not have any such skills. Suprun founded Patriot Defense, a nongovernmental organization that trained tens of thousands of Ukrainian soldiers and helped to bring down the mortality rate significantly. Last week the parliament voted on Suprun’s reforms, which had become the focus of the entire anti-corruption agenda in Ukraine. “The parliamentary committee on health care, pharma-mafia, those who make money on corruption are in the way because we are cutting off their funding,” Suprun told The Daily Beast before the vote. “One of my critics, a well-known head doctor of a cardiological hospital, who we knew was taking up to $10,000 for implanting one stent, accused me of killing Ukrainians, even of a genocide! He started a campaign to discredit me,” Suprun said. Was she ready to experience more attacks? In many countries the hugely expensive equipment in hospitals is leased. But in Ukraine, that’s forbidden by law. Why? Because kickbacks are built in to the sales, generating enormous income every year for everybody in the corrupt chain. “The pharmo-mafia and some hospitals make billions of dollars, while we want the purchasing to be done by international organizations including the UNDP, UNICEF, through tenders,” Suprun explained. “There is a tiny piece left to fix the poor infrastructure of hospitals and pay extremely low salaries for the workers,” Suprun said. The average salary of a Ukrainian doctor is about $200 a month. “That’s what makes medical workers charge payments for their services, then kick back up to their head doctors and higher,” she said. Suprun and her team traveled to London to present their reform to a panel at Chatham House. “It was said that to improve the playing field for foreign investors in Ukraine, one needed to strengthen the rule of law, have less regulation and eradicate corruption,” one of the panel’s participants, former OSCE spokesman in Ukraine Michael Bociurkiw told The Daily Beast. The parliament did not pass the reforms, and Suprun admitted afterward they didn’t get adequate support from the powers that be. “Our team worked effectively to prepare the reform, but there was no political will to continue this at the top level,” she said.